Home | Mises Library | On "Private Tyrannies"
As state capitalism developed into the modern era, economic, political and ideological systems have increasingly been taken over by vast institutions of private tyranny that are about as close to the totalitarian ideal as any that humans have so far constructed. Within the corporation all policies emanate from the control above. In the union of this power to determine policy with the execution thereof, all authority necessarily proceeds from the top to the bottom and all responsibility from the bottom to the top. This is, of course, the inverse of "democratic" control; it follows the structural conditions of dictatorial power. But what are the "structural conditions" for dictatorial power? And are corporations really "about as close to the totalitarian ideal as any [institution] that humans have so far constructed," as Chomsky contends? Is Starbucks as close to the totalitarian ideal as, say, the National Socialist regime of Adolf Hitler? Is Walmart as totalitarian an institution as the Bolshevik state of Vladimir Lenin? Even to ask these questions is to see their patent absurdity. For, while a dictatorship is certainly structured as a hierarchy, this is most clearly not a sufficient condition. Rather, the most basic and essential condition for dictatorial power, which stands out unmistakably in truly totalitarian regimes, is the ability of the dictator to initiate physical force to compel others to do as they are told. Without government support, corporations and other hierarchical business entities lack the power to forcibly compel anyone to obey their policies. Corporate managers may rightly enforce contractual agreements with their workers and others, as may anyone else. They may insist that their workers obey their policies if they wish to remain employed. But they cannot chain employees to their desks, or threaten to imprison them if they should fail to render their pound of flesh. The truth is that workers in a corporation choose to be there because they prefer this to the available alternatives. They are not forcibly compelled to be there, and they face no threat of violence if they fail to turn up to work and do their jobs. Rather, many people choose to work within corporations or other hierarchical business enterprises and take a subordinate role to their bosses because they are offered money and other benefits to do so. By virtue of the voluntary nature of this action, the workers clearly regard this trade as beneficial ex ante; if they did not, they would not enter into this role. Furthermore, if circumstances change, and workers do not anticipate that the benefits of their ongoing employment will outweigh the sacrifices involved — including the costs of foregoing other opportunities — then they will leave their employment for greener pastures, as happens often in the corporate world. Of course, Chomsky would claim that workers are essentially "forced" to obey the corporation because it owns part of the means of production that the worker requires to produce goods. He would regard the arrangement between the corporation and the employee as "wage slavery." A disastrous intellectual package-deal, put over on us by the theoreticians of statism, is the equation of economic power with political power. You have heard it in such bromides as: "A hungry man is not free," or "It makes no difference to a worker whether he takes orders from a businessman or a bureaucrat." Most people accept these equivocations — and yet they know that the poorest laborer in America is freer and more secure than the richest commissar in Soviet Russia. What is the basic, the essential, the crucial principle that differentiates freedom from slavery? It is the principle of voluntary action versus physical coercion or compulsion. The difference between political power and any other kind of social "power," between a government and any private organization, is the fact that a government holds a legal monopoly on the use of physical force. The distinction between economic and political power is why even the largest and most (economically) powerful corporations differ fundamentally from governments. The latter are tyrannies precisely because they initiate the use of violence to extract wealth from their subjects and enforce their will. The former, far from being tyrannical, refrain from violence (except to the extent that they act in league with the government) and instead obtain their wealth by offering abundant opportunities for mutually beneficial exchange to others — their workers, suppliers, customers, and so on. While the policies and "controls" imposed by corporate managers on their workers are merely a legitimate exercise in mutual exchange, even the notion that "all authority necessarily proceeds from the top to the bottom and all responsibility from the bottom to the top" is true only in the most superficial and immediate sense. Under free-market capitalism, the authority of the worker consists in the fact that he may withdraw his labor (i.e., the entire benefit he provides to his employer) at any time that he becomes dissatisfied with his conditions of employment. Corporate managers regularly lose workers to those who make them a better offer, and since the free market provides abundant opportunities for work and entrepreneurial activity, the power to withdraw one's labor from the service of an employer is a formidable power indeed. In fact, the commonly heard notion that employers have superior bargaining power in this employment transaction is a complete fallacy. Although there is nothing inherently wrong with private business entities with a hierarchical management structure, one legitimate criticism of corporations and other businesses is that they often receive special privileges from the government and vicariously exercise force with government assistance. Most major corporations are recipients of special privileges from governments in one form or another, whether through direct grants of funding, taxpayer-funded government contracts, or regulatory laws that assist them to crush competition from smaller competitors through the capture of regulatory bureaus. To the extent that any of these vicarious uses of political power are used, the problem is not with the hierarchical nature of the business, nor with its ownership of private property — the problem is the special privileges granted to business, privileges that involve a violation of the property rights of others, and that should be repealed. Such special privileges are only possible because of the abuse of the political power of government. "While he frames his argument as a critique of 'state capitalism,' Chomsky's quarrels with private business entities do not rest on any allegation of the initiation of force…"
Some may object that even the special legal treatment of incorporated entities (where the corporation is granted legal personality separate from its members and the members are not liable for its debts) involves illegitimate special privileges, such that all corporations, in the strict legal sense of the word, are illegitimate. However, if this is the case, then the remedy is simply to withdraw the privileged status of such entities and to ensure that they operate in accordance with the normal rules for other business entities. Arguments over the illegitimacy of special privileges, or the vicarious exercise of political power by private businesses, should not be confused with Chomsky's argument against "private tyrannies." While he frames his argument as a critique of "state capitalism," Chomsky's quarrels with private business entities do not rest on any allegation of the initiation of force either by these corporations or on their behalf. Rather, he contends that it is the hierarchical nature of private business entities and their private ownership of property that makes them antidemocratic and therefore "tyrannical." Although Chomsky, Brady, and other critics of private economic power usually target "corporations" or "multinational corporations," their arguments apply every bit as much to other hierarchical business entities that own private property. Because of his distaste for hierarchical organization and private property, Chomsky lauds the democratic control of governments (to the extent that such democratic control exists). And yet, this control is merely the majority rule of a criminal enterprise that habitually initiates violence against its subjects as a means of control. In this context, the control granted by voting is nothing more than the ability to influence the identity of one's own slave master. Moreover, Chomsky does not call for the removal of the government powers and regulatory laws that allow large corporations to suppress and destroy their smaller competitors and would-be competitors. Instead, he wants to see government regulations preserved and expanded. I'm not in favor of people being in cages. On the other hand I think people ought to be in cages if there's a saber-toothed tiger wandering around outside and if they go out of the cage the saber-toothed tiger will kill them. So sometimes there's a justification for cages. That doesn't mean cages are good things. State power is a good example of a necessary cage. There are saber-toothed tigers outside; they are called transnational corporations which are among the most tyrannical totalitarian institutions that human society has devised. And there is a cage, namely the state, which to some extent is under popular control. The cage is protecting people from predatory tyrannies so there is a temporary need to maintain the cage, and even to extend the cage. It is especially revealing to note that Chomsky does not state who is to hold the keys to his allegorical cage. However, despite his silence on this issue, the answer is clear enough — for if he allowed those people allegedly being protected by the cage to hold the keys, he would have to admit their ability to leave the cage and to choose to deal with the saber-toothed tiger, which he clearly does not. Only the philosophy of free-market capitalism allows a person to leave the cage of government if he wishes — if he sees the supposedly dangerous saber-toothed tiger as benign, he may let himself out to pet it and play with it. Despite the large number of mergers, and the growth in the absolute size of many corporations, the dominant tendency in the American economy at the beginning of [the 20th] century was toward growing competition. Competition was unacceptable to many key business and financial interests, and the merger movement was to a large extent a reflection of voluntary, unsuccessful business efforts to bring irresistible competitive trends under control.… As new competitors sprang up, and as economic power was diffused throughout an expanding nation, it became apparent to many important businessmen that only the national government could rationalize the economy. Although specific conditions varied from industry to industry, internal problems that could be solved only by political means were the common denominator in those industries whose leaders advocated greater federal regulation. Ironically, contrary to the consensus of historians, it was not the existence of monopoly that caused the federal government to intervene in the economy, but the lack of it. Will the genuine antistatists please stand up? This move away from the diffusion of economic power under (relatively) free-market capitalism shows us that it is the free market, with its repudiation of regulatory laws and other political powers, that is the most likely system to diffuse economic power widely among small businesses and individuals, and the least likely to sustain high concentrations of economic power. Of course, the justification for the free market does not rest on this contention, and even if this were not the case it would present no legitimate objection to the free market, since the use of economic power is perfectly legitimate, whereas the initiation of force is not. The economic power of private business organizations, even the so-called "private tyrannies," is justified by the fact that the use of economic power involves no initiation of force against any other person or their property. Political power, on the other hand, involves the initiation of force against others and is therefore unjustified. If he wishes to avoid genuine tyranny, Chomsky would do well to bear in mind this fundamental difference when applying his oft-stated principle that any relationship of authority must be justified. Chomsky, N. (2005) Chomsky on Anarchism. Edinburgh: AK Press, p. 191. Brady, R. (1943) Business as a System of Power. New York: Columbia University Press. Emphasis added. Cited in Chomsky (2005), p. 191. A consistent anarchist must oppose private ownership of the means of production and the wage slavery which is a component of this system, as incompatible with the principle that labor must be freely undertaken and under the control of the producer. See Chomsky, A.N. (1973) "Notes on Anarchism." Here we see that Chomsky does not regard labor for private enterprise as "freely undertaken." Rand, A. (1967) Capitalism: The Unknown Ideal. New York: Signet, p. 46. Emphasis in original. Ludwig von Mises explains why unemployment in the unhampered market is always voluntary (see Mises, L.v. (1998) Human Action: The Scholar's Edition. Auburn, Al. : Ludwig von Mises Institute, pp. 595–98). In fact, one of the most common problems cited by businesses in employer surveys is the difficulty in finding skilled workers. For example, see Deloitte (2008) "Talent Shortage Emerges as No. 1 Employer Concern." In a competitive market, the remuneration and conditions of workers will be determined according to the additional revenue that their employment produces for their employer (known in economic terminology as their "marginal revenue product"), and an employer has no means to pay less than this going rate (at least not for long) if he wishes to retain his staff from other enterprises. On this issue, see DiLorenzo, T. (2004) "Do Capitalists Have Superior Bargaining Power?" Mises Daily, September 6, 2004. This phenomenon is known as regulatory capture. According to the economist George Stigler, "as a rule, regulation is acquired by the industry and is designed and operated primarily for its benefits." See Stigler, G.J. (1971) "The Theory of Economic Regulation," Bell Journal of Economics and Management Science 2(1), p. 3. For discussion of the problems of incorporation under classical liberalism, see van Eeghen, P. (2005) "The Corporation at Issue, Part I." 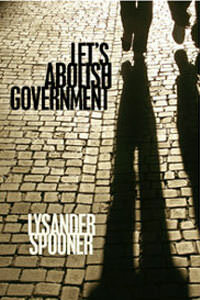 Journal of Libertarian Studies 19(3), pp. 49–70. For example, see Chomsky, N. (1996) "Free Market Fantasies: Capitalism in the Real World." Lecture delivered at Harvard University, April 13, 1996. Here Chomsky conflates regulations that restrict private property use and laws that actually protect property rights. He also incorrectly blames deregulation for the overfishing in lakes that is actually caused by the lack of private-property rights in lakes and other bodies of water (the tragedy of the commons). For more on Chomsky's dubious "anarchist" credentials, see Loberfeld, B. (2003) "The Coercive Anarchism of Noam Chomsky," Liberty 17(2), pp. 33–37. See also Ostrowski, J. (2003) "Chomsky's Economics," Mises Daily, January 6, 2003. "On Human Nature: Noam Chomsky interviewed" by Kate Soper, Red Pepper, August 1998. Kolko, G. (1963) The Triumph of Conservatism. New York: Free Press, pp. 4–5. See "Anarchism 101 with Noam Chomsky" on YouTube.com.